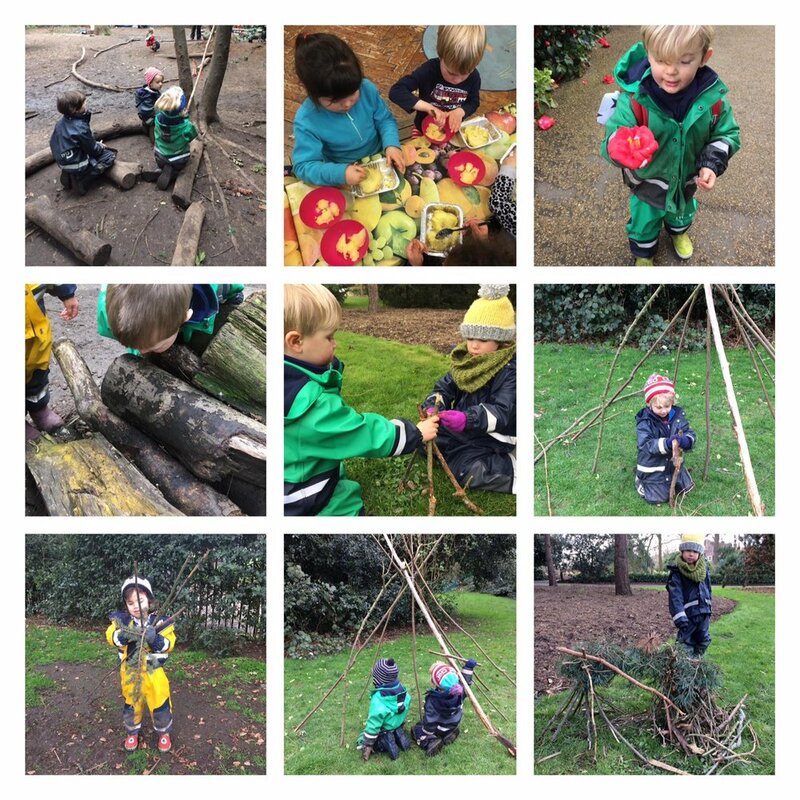 This week has seen a real focus on den building, both big enough for the children to play under and small enough for forest creatures to make their home. It has been great to see some of the children work together to create their dens, using different shapes and exploring how well they stay up. Their explorations led to the discovery that a triangular shape, like a teepee was the strongest. With the high winds from last week there has been an abundance of sticks around and the children have used bits of bark or string to tie them together. The structures have quickly doubled in size and separate rooms identified as parts of houses, “this can be the bedroom and this can be the kitchen”. Pine needles or ferns have covered the roof and bark, wood chips or leaves have been laid as carpet. The children have welcomed others into their play and worked together for long periods of time to create these masterpieces. With Spring just around the corner (or so we have been promised) we’ve been making regular trips to the allotment again, busily getting the soil ready and beginning to plant our first lot of seeds. This week the children have been planting onions and kale in rows, learning how to dig a trench, plant the seeds and cover the soil over the top before giving the soil some water to help the plants begin to grow. We are already looking forward to producing another abundant crop of fruit and veg for our cooking sessions, snacks and mealtimes this summer. We have also been busy making our Spring tree to add to our collection of the seasons. We have enjoyed gluing down a selection of Camellia flowers that we found around the gardens. The children have compared the different colours and patterns on the Camellia petals and shared their varying preferences for which colours they like the best. This week we have enjoyed cooking jacket potatoes in our Wednesday evening cooking session. This involved scooping out the potato, mixing it with Crème fraîche and adding chives, parsley or dill depending on individual preference. We then returned the potato mixture to the jackets ready to bake in the oven at home. Yum! For any parents that are interested the Kitchen Gardens at Chiswick House and Gardens will be open to the public this weekend, so please feel free to go and check out our Little Forest Folk allotment where the children are busy gardening through most of the year. The gardens will also have Camellia flowers available for purchase.